Nick Castellanos enjoyed the best offensive season of his career in 2018, posting a robust .298/.354/.500 batting line with 23 home runs, good for a 130 OPS+. He was the best hitter in an underwhelming Tigers lineup, making him a natural trade candidate as he enters the final year of arbitration eligibility. While his offensive profile leaves little to be desired, there is, as always, a caveat: Castellanos is a liability in the field, whether at third base, where he began his career, or in right field, where he started 142 games last season. After transitioning to right late in 2017, Castellanos did improve in 2018 when given the opportunity to play the position full-time – his UZR/150 innings improved from -57.6 in 2017 to -12.3 last season – but he remains an underwhelming defensive performer, and therefore best suited as a designated hitter with an American League club. If the Tigers plan to deal Castellanos, and they’re said to be “determined” to do so, now is the time. Even if teams are less willing to surrender significant pieces than they might have been a year ago, when he still had two years of team control remaining, he will still be just 27 years of age during the 2019 season, and the single year of team control can be an asset. If Detroit can’t find a match, there is an argument to be made that he could attract a more robust market in July when half of his 2019 salary has already been paid, especially if he continues on his upward trajectory. Regardless, the Tigers, who will almost certainly find themselves well outside of playoff contention in 2019, would likely prefer to cash in now, if only to avoid the worst case scenario of an unceremonious (and uncompensated) free agent departure next winter. The rub here being they need to find a trade partner. After trading away Matt Kemp and Yasiel Puig, the Dodgers could certainly add an outfielder, and they happen to be the most recent team linked to Castellanos. Carrying more traditional platoon splits than Puig, Castellanos fits as the right-handed impact bat the Dodgers reportedly seek. Still, the scuttlebutt around Los Angeles paints two different pictures: one where the above trade clears the necessary payroll to approach big fish like Bryce Harper or A.J. Pollock, while the other tale insists management plans to dip under the luxury tax again in 2019. If the latter is true, Castellanos would be a reasonable (and considerably cheaper) alternative. Much like the Dodgers, the Rays have plainly stated their intentions to bolster their lineup with a right-handed power hitter. Recent acquisition Yandy Diaz might be that guy, but they’ve also been linked to Cardinals’ slugger Jose Martinez and free agent Nelson Cruz, both of whom would fill a similar role as Castellanos. On the other hand, C.J. Cron provides a similar profile at half the cost, and the Rays non-tendered him. Even if the Rays’ value Castellanos’ “versatility,” or simply, if they (understandably) believe him the better overall hitter – it would still be quite the leap to pay Castellanos twice as much as Cron, while also giving up a prospect to get him. With Michael Brantley, Edwin Encarnacion, and Yonder Alonso all donning new uniforms in 2019, the Indians need to replace a considerable amount of the offensive production that carried them to another AL Central title last season. Couple that with their need in the outfield and Castellanos seems a natural target. Still, with the recent trade that brought Jake Bauers and Carlos Santana, both 1B/DH types, to Cleveland, there may not be room for Castellanos if they don’t like his defense in right. As a trio they could rotate between first base, right field and DH, whether that means Bauers in right, Santana at first and Castellanos at DH, or Castellanos in right, Bauers at first and Santana at DH. Add Bradley Zimmer to the mix when he returns from injury and manager Tito Francona would have a defensive option for right to mix-and-match with as well. Whichever particular permutation Francona likes best, there’s enough playing time to keep everyone fed. Given the Indians’ reluctance to add payroll this offseason, however, Castellanos may prove too costly. As a short-term rental, his $11.3MM projected salary is palatable – the prospect cost may be a bigger deterrent, especially if Detroit charges an intra-division premium. Same goes for the Twins, who with their surprising amount of free payroll space are dark-horse players for many big name free agents/trade targets. They have been tied to Cruz as a free agent for the void left at DH after Robbie Grossman’s non-tender, and they should know Castellanos game intimately, for better or for worse. Max Kepler and Eddie Rosario are penciled into the outfield corners, but both are flexible players who can move around the diamond a little as needed to make room for an impact bat. Besides, the Twins are lapping the the field in the number of players in need of a PR re-launch, so adding Castellanos to a lineup already featuring Byron Buxton, Miguel Sano, Cron and Jonathan Schoop keeps the Twins on brand. Still, just because someone likes butterscotch doesn’t mean they only like butterscotch, and it might be the Twins have enough [big-bodied right-handed sluggers] butterscotch on hand already. Returning to the NL, the Rockies or Giants could theoretically find room for Castellanos as a platoon bat, but the best fit is probably Atlanta. The Braves have an open spot in their outfield if Nick Markakis signs elsewhere, and they’ve checked in with the Tigers about Castellanos. But the same questions abound for the Braves as would any National League team. Namely, does Castellanos’ bat make up for his poor defense, and if not, is the $11.3MM price tag plus Detroit’s prospect ask too much to pay for a platoon/bench bat? For non-contenders, almost certainly not, which limits the field of potential dance partners for Detroit. The free agent outfield market is fairly barren, however, and considering the left-leaning rotations among contenders like the Dodgers, Cubs, Yankees, and Red Sox – plus Patrick Corbin in Washington, Kyle Freeland in Colorado, and Blake Snell in Tampa – there should be no shortage of pennant hopefuls capable of putting a lefty masher like Castellanos to work. Teams in a rebuilding posture still frequently invest in some veterans, with part of the rationale being that those players can turn into trade assets in the middle of the season. For the Tigers, the most visible offseason spending took place in the rotation, with the club pouring $10MM into starting pitching (Mike Fiers and Francisco Liriano). 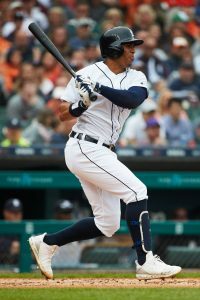 Detroit made just one other winter investment of consequence: a $1.75MM promise to center fielder Leonys Martin. (The deal also includes $1.25MM in available incentives, topping out at 500 plate appearances.) The club needed a solid piece in the outfield and got a 30-year-old who has generally been a useful big leaguer but had trouble holding onto a MLB roster spot last year. Needless to say, it wasn’t a highlight of the offseason. Thus far, however, Martin has been one of the fifty or so most valuable position players in baseball. There are certainly some limits to his appeal, but he also looks to be quite a useful potential trade piece for the Tigers. Notably, Martin was dealt to a contender in the middle of 2017 despite his struggles last year at the MLB level. He’s an up-the-middle defender who has always been an outstanding baserunner, which explains why the Cubs picked him up and ended up putting him on their postseason roster. Now, the profile is much more interesting. Through 291 plate appearances, Martin carries a .261/.333/.444 batting line with nine home runs and seven stolen bases. His output includes a 9.3% walk rate that’s easily the best rate of his career. Martin is posting a personal-high .184 isolated slugging mark, and has done so without increasing his strikeout rate (at 22.3%, it’s almost exactly at his career mean). That’s not exactly world-beating offensive work, but it’s above-average output from a player who is best known for his defensive and baserunning skills. UZR is more bullish on his work in center this year than is DRS, but Martin has long drawn positive (or even outstanding) grades on the outfield grass. He’s also still receiving high marks on the bases, another area he has thrived traditionally. All things considered, if the work at the plate seems sustainable, Martin could be a notable piece for the right team. Is it? Martin’s advancing walk rate is certainly promising. And it’s quite interesting to note that the power seems to be coming from a notable change. Entering the year, Martin had a career launch angle of just 9.4 degrees. Thus far in 2018? It stands at 17.1 degrees, which has helped drive a newly robust power output. Better still, Statcast measures indicate that Martin has actually struck the ball even better than the results suggest. He owns a .334 wOBA but is credited with an eye-popping .384 xwOBA. Martin has a career hard-hit rate of 27.6% but is sitting at 40.1% at present. So, what’s the catch? The biggest knock on Martin, beyond the need to discount his new profile somewhat based upon his prior track record, is the fact that he still doesn’t hit lefties. He’s delivering some pop (.190 ISO) so far in 2018, but carries a meager 55 wRC+ against southpaws. The spread is much wider this year than it has been historically, but he has long been more effective when hitting with the platoon advantage. Teams likely won’t go wild for Martin, then. But the still-developing trade market doesn’t figure to have loads of quality outfield options available. And Martin is not only affordable but controllable for 2019. His struggles last year left him just shy of reaching a new service-year threshold; he had 4.161 years entering the current campaign. That leaves one year of arbitration still to go, though his representatives will argue that the salary ought to build off of a prior high-point (he earned $4.85MM in 2017) rather than his 2018 earnings. Of course, that extra season leaves the Tigers with some options, too. The club might prefer to hold onto Martin, who’d be a useful piece for an organization that has received somewhat better-than-expected results from its roster this year. Or, he could be dealt over the winter. The Tigers’ plans aren’t really clear just yet; the point, though, is that there are options and some leverage here for GM Al Avila. Though we noted Blue Jays righty Marco Estrada as a possible trade candidate in our first ranking of the 50 top trade deadline assets, he only rated mention on the outside of the list. To that point of the season, after all, Estrada had largely been ineffective. With a $13MM salary, there wasn’t a ton of appeal in a player who’ll turn 35 in early July. That situation, however, is beginning to change. Estrada has been one of the better starters in baseball over the past month, accumulating an even 1.0 fWAR over the past thirty days — something only ten other hurlers in the game have accomplished. In his last four outings, in particular, he has worked to a 1.75 ERA with 26 strikeouts against five walks. How has it happened? It’s a bit difficult to say for sure, as there haven’t been any truly dramatic swings in his approach or stuff. But his fastball sure has been more effective: it was valued at -1.53 runs per one hundred pitches through May, but has jumped to a +4.27 valuation on a rate basis in June. And Estrada has been pumping first-pitch strikes at a greater rate in the past month as well (going from 63.4% to 69.5%). Meanwhile, the shape of his changeup has altered somewhat, exhibiting less horizontal and slightly more vertical movement over his past four starts. These changes are subtle enough that they may not really reflect much at all of substance. The primary drivers, perhaps, still need to be sussed out and assessed for sustainability. But it does not seem that Estrada has simply been the beneficiary of a correction in batted-ball fortune. Statcast suggests he deserved the poor outcomes that befell him through the end of May, and has simply been much better at limiting good contact since. In the aggregate, it’s certainly far too soon to declare Estrada a newfound ace. In all likelihood, his true talent at this point pegs him as a solid hurler who could help a contender fill out a competitive rotation. That general impression is buttressed by a review of Estrada’s past several seasons. Upon landing in Toronto, he had great results in 2015 and 2016 before a downturn last year. But his underlying statistics have been fairly consistent all along. 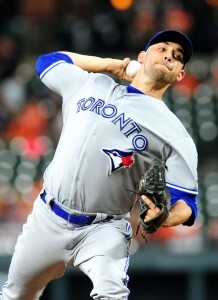 In total, over 627 1/3 innings with the Jays, Estrada owns a 3.96 ERA with a 4.40 FIP, 4.91 xFIP, and 4.57 SIERA. To the extent it’s reasonable to anticipate that he will outperform the ERA estimators somewhat, it’s likely not wise to hope he’ll do so by any great margin. Barring a sustained run over the next month, Estrada likely won’t generate a huge amount of excitement at the trade deadline. But he increasingly looks like a solid piece for the right team. He has been good for about thirty starts and 180 frames annually of late, and despite some ups and downs is perhaps reasonably viewed as a sturdy back-of-the-rotation arm overall. As the above-linked list of top deadline candidates shows, the crop of rotation targets is rather thin at present. The Jays surely won’t be able to draw any significant offers of young talent for Estrada. But perhaps they’ll manage to offload a decent chunk of his remaining salary obligations next month. That’s not to say it’s any kind of sure thing that he’ll end up elsewhere. After all, we’ve wondered previously whether the veteran hurler would leave the Jays, only for him to agree to successive contracts just before reaching the open market (see here and here). As the non-waiver trade deadline draws nearer, Zach Britton will be among the most oft-speculated and oft-rumored players to be on the move. It’s difficult to fathom a scenario in which the Orioles don’t trade their longtime closer, given that the alternatives are losing him for nothing or issuing a qualifying offer worth more than $18MM to a player who has currently thrown 41 2/3 innings dating back to Opening Day 2017. It’s that level of uncertainty surrounding Britton, though, that makes his trade candidacy particularly intriguing. It stands to reason, of course, that several teams will be interested in the once-dominant lefty. FanRag’s Jon Heyman reports that the Astros (who nearly acquired Britton last July) and Indians are already in on Britton. It’s reasonable to expect that virtually every team within a stone’s throw of contending will check in on Britton (or already has checked in on Britton) between now and the deadline. But should Britton be considered a premium trade chip? Britton is teeming with name value — and with good reason. From 2014-16, he was very arguably the best relief pitcher on the planet. Over that three-year stretch the southpaw posted a 1.38 ERA with 9.3 K/9, 2.4 BB/9, 0.3 HR/9 and a historic 77.9 percent ground-ball rate in 209 innings. He set the all-time record for single-season ground-ball rate in 2015 and then broke his own record a year later when a staggering 80 percent of balls put in play against him were hit on the ground. Britton missed bats and limited walks, and it was virtually impossible to lift the ball against him. He was an absolute buzzsaw in the ninth inning. No relief pitcher in the game topped Britton’s 9.5 RA9-WAR in that time. In the time that has followed, however, Britton has seen his 2017 season cut roughly in half by forearm injuries. Then, in the offseason, he suffered a ruptured Achilles tendon that required surgical repair and ultimately kept him on the shelf until mid-June. He’s only just now returned, and he’ll have scarcely more than six weeks to show contenders that he’s worthy of being deemed an impact reliever once again. Had Britton been his usual self in 2017, perhaps it’d be worth giving him the benefit of the doubt on the heels of a non-arm injury. But the 2017 version of Britton, in spite of a solid 2.89 ERA, simply didn’t look all that dominant. Last year’s 18 percent strikeout rate (7.0 K/9) was Britton’s lowest since moving to the bullpen in 2014. His 11.5 swinging-strike rate was his lowest as a reliever by nearly five percent, and his 31.8 percent chase rate was six percent lower than his 2015-16 peak. Britton still induced grounders at an elite rate (72.6 percent), but not at the historic levels he’d reached in the three preceding seasons. 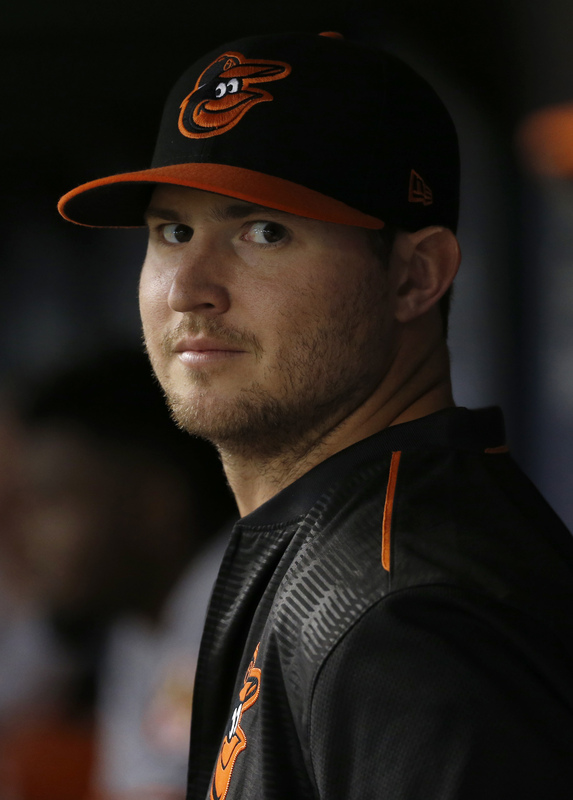 And after walking just 6.9 percent of the hitters he faced from 2014-16, Britton walked 11.2 percent of his opponents last season en route to a 4.34 BB/9 mark. Britton was a good reliever last season, but he wasn’t elite and didn’t perform at a level commensurate with his $11.4MM salary. Britton still received a raise to $12MM, though, even after the Orioles knew he’d require surgery to repair his ruptured Achiles, and that salary is all the more problematic now in 2018. Britton is owed about $6.45MM through season’s end, as of today. (It’d be about $3.94MM on the day of the non-waiver trade deadline.) That’s a rather significant sum for a team in the middle of the season — especially with the number of contenders who are either over the luxury tax limit (Nationals, Red Sox) or trying hard to remain slightly south of it (Yankees, Dodgers, Giants). So far in 2018, Britton has only faced 17 batters and totaled 4 1/3 innings of work, so it’s hard to glean all that much from his early results. That said, it should be of at least mild concern that his average sinker is down from 96.1 mph in 2017 to 93.7 mph in 2018. He’s allowed just one hit in facing those 17 opponents and picked up five strikeouts, but he’s also walked four of them and thrown a first-pitch strike to just eight of them. That wouldn’t be especially concerning in a vacuum, but given the backdrop of last season’s control issues, it’s hardly promising to see Britton struggling with to locate the ball early out of the gates. 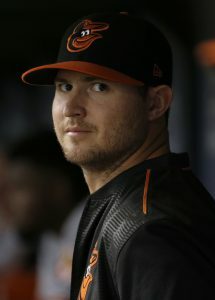 Britton’s trade candidacy, perhaps more than any other player who is likely to be moved this summer, is punctuated by “ifs.” If his velocity returns, if his control improves, if last year’s lack of whiffs proves to be a fluke and if the Orioles are willing to absorb some salary, he may very well end up looking like the premium trade chip that many expect him to be based on his name value. Right now, however, Britton looks like a solid but expensive reliever whose on-field results haven’t lined up with that name value in nearly two calendar years. The Reds don’t have much going on at the MLB level this year. Their 19-36 record is a bit disappointing, perhaps, but largely aligns with expectations after a winter that mostly involved acquiring some affordable pitching depth to supplement a returning roster filled with question marks. There have been some recent front-office wins, though. Offseason additions David Hernandez and Jared Hughes have been nice bullpen buys to this point; both could end up as deadline assets or useful pieces for the 2019 season. The extensions of Tucker Barnhart and Eugenio Suarez have worked out nicely so far. Reclaiming Matt Harvey seems to be a worthwhile, albeit still-uncertain venture. Perhaps the biggest score of late, though — setting aside the landing of Luis Castillo, at least — has come via the waiver claim of Scooter Gennett from the division-rival Brewers late in Spring Training last year. Gennett was very productive in 2017, but has now elevated his output yet further in the new season. With the picture of the 2018 trade deadline beginning to take shape, he’s a potential source of trade value for the Reds and an interesting player to examine. Avid readers of MLBTR may recall that, at times in the past, I have shed some doubt on Gennett’s merits as a trade candidate. His effort last year was not accompanied by any improvements to his plate discipline, he carried a somewhat elevated .339 batting average on balls in play with less-than-promising Statcast data (.367 wOBA vs. .322 xwOBA), and he continued to struggle against same-handed pitching (.248/.287/.404 vs. lefties). Entering the current season, then, my own expectations were not terribly lofty for the 28-year-old, who is playing on a reasonable, but not exactly cut-rate $5.7MM salary. That non-bargain pay grade also weighs down the value of controlling Gennett’s 2019 season via arbitration. It wasn’t all that surprising that he remained with the Reds when the season began, particularly given the relative dearth of demand at second base, a position that he has never fielded with particular excellence. Rumors of regression have to this point been greatly exaggerated, though, as Gennett is off to a fabulous start in the new year. Through 212 plate appearances this year, he’s slashing a healthy .340/.376/.558 with ten home runs. That’s good for a 156 wRC+. Despite typically middling defensive grades at second base, Gennett has already contributed 2.2 rWAR / 1.9 fWAR on the year. Basically, Gennett is performing right now like a post-breakout Daniel Murphy. The added benefit here, of course, is that he’s younger and cheaper. Gennett is even torching lefties thus far, with a .364/.375/.545 slash that quiets one of the most obvious critiques of his abilities at the plate. Impressive as Gennett has been, though, some concerns continue to nag. Surely, he won’t be able to sustain a .405 batting average on balls in play. Statcast numbers again indicate that he has been somewhat fortunate, grading him at a .349 xwOBA that substantially lags his actual .397 wOBA. 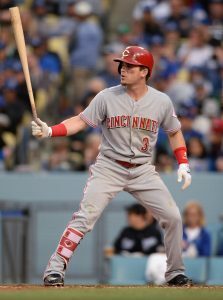 Gennett certainly has not shown any leaps in the plate-discipline department, as he has an unremarkable combination of a 20.7% strikeout and 5.1% walk rate to begin the 2018 season. And these signals are all the more evident in his 57 plate appearances against southpaws (.514 BABIP, 18:1 K/BB). It still seems, then, that some regression is in store. But Gennett has shown signs of real change, too. He has quietly converted groundballs to line drives of late. In 2016, he put the ball on the ground 44.7% of the time and hit liners on 20.8% of his batted balls. Thus far in 2018, he’s at 37.3% and 26.6%, respectively. Though he’s not a particularly dramatic participant in the Launch Angle Revolution, Gennett has steadily elevated over time, moving from an average of 10.5 degrees (2015) to 11.7 degrees (2016) to 12.8 degrees (2017). This year, so far, he sits at 14.4 degrees on average. Of late, Gennett has maintained a lofty homer-per-fly rate (20.8% last year, 17.5% this). An optimist might argue that this interesting blend of data points suggests that Gennett has honed in on being the best version of himself. He’s hitting the ball sharply on a line while generating well-struck high flies when that’s what’s available. That it has come through steady development rather than an obvious change in approach should not necessarily represent a red flag. Pessimists, on the other hand, will cite many of the above figures in support of the proposition that Gennett’s skills simply don’t support this kind of output. By that view, while he’s going well over an extended stretch, Gennett still hasn’t provided good reason to believe it’s sustainable. Projection systems, for instance, generally anticipate that he’ll settle into producing in range of the league-average rate. We still have about two months of action left before the trade deadline, so the evidence is still being gathered. At some point, though, contending teams with a need at second base will need to decide whether it’s worth trying to pry Gennett loose from the Reds. Just how willing the Cincinnati organization is to deal, meanwhile, could depend in part upon whether and when top prospect Nick Senzel forces a promotion. But the biggest driver will likely be the quality of the offers. There are a few other second basemen that will surely be weighed as deadline targets — MLBTR’s Steve Adams recently listed a few — but Gennett is the one presently pacing all MLB second baggers in offensive output. It’s hardly certain that there’ll be broad demand at the position. That may not be entirely necessary if Gennett truly stands out, but that’s just where the core question lies. Clearly, he has proven since joining the Reds that he’s a quality MLB player who can help a contender. But unless one or more teams come to believe he’s truly an everyday, high-level type of performer, it’s fair to wonder whether an offer will come in that’s strong enough to pique the Reds’ interest. The Rangers faced an uphill battle even before the season began, as they were chasing the defending World Series champions in the AL West. Now that the club is off to a 20-31 start, looking up at three other teams sporting winning records, it’s all but inevitable that the Texas organization will explore sales of veteran assets this summer. There are a few interesting players to watch on the Rangers’ roster, with Adrian Beltre and Elvis Andrus certainly among them. But both of those veterans are currently situated on the DL, rather than the left side of the Texas infield, so it’s not the best time to look in at their market. Instead, it’s southpaw Cole Hamels who seems the clearest possible trade piece at the moment. He’s a highly accomplished pitcher, with a resume that includes 16 postseason starts, who’s playing on an expiring contract. Through 58 2/3 innings on the season, Hamels owns a 3.38 ERA that’s nearly a spot-on match for his career average. While he’s no spring chicken at 34 years of age, that’s not much of a concern for a rental asset. That’s not to say there aren’t any countervailing factors here. For one thing, Hamels wasn’t great last year, when he failed to record an ERA of 3.65 or below for the first time since way back in 2009. Even his 4.20 earned run mark, moreover, arguably required some good fortune. Hamels held opposing hitters to an unsustainable .251 batting average on balls in play. For the first time ever, he failed to record a double-digit swinging-strike rate (9.7% on the year) and struck out less than seven batters per nine (6.4). 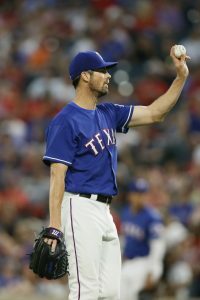 Hamels also hit the shelf for the first time in a long time owing to an early-season oblique injury. There were some legitimate questions, then, entering the current season. Some, perhaps, have been answered. Though he missed eight starts in 2017, Hamels has otherwise been a paragon of durability, taking the ball thirty or more times in nine straight seasons (2008 through 2016). Unless something crops up between now and the trade deadline, teams will surely view Hamels as an excellent health bet over the final few months of the season. But what kind of performance can be expected? In many regards, Hamels’s 2018 performance has encouraged. In particular, he has rebounded in terms of swings and misses (12.1% swinging strikes; 9.8 K/9). But there are some issues. Hamels has continued to hand out more free passes than he did earlier in his career. He has coughed up 1.69 homers per nine on a an 18.6% HR/FB rate. And he’s again benefiting from a low (.255) BABIP-against. The Statcast numbers indicate that opposing hitters have been unfortunate to record only a .317 wOBA, as their contact against him spits out a .352 xwOBA. Taken together, it seems reasonable to view Hamels as a solid and reliable mid-rotation piece, but not a top-of-the-rotation arm. He’s producing a wide array of fielding-independent pitching numbers (4.94 FIP/4.12 xFIP/3.85 SIERA) thus far on the year, but all suggest that he’s more good than great at this stage. Of greater importance, perhaps, is Hamels’s contract, which was originally signed with the Phillies just in advance of the 2012 trade deadline. The lefty is earning $22.5MM this season. Even if a contender feels that he’s worth every penny — which, as the above discussion suggests, may or may not quite be the case — that’s enough coin to be a potential stumbling block for teams that face luxury tax or other budgetary concerns. There are some other contractual complications, too. The deal comes with a $20MM vesting/club option that carries a $6MM buyout. It’s not going to vest owing to the number of innings Hamels threw last year, but it’ll require some added financial wrangling nevertheless. An acquiring team could consider picking up Hamels at that rate for 2019, depending upon how the season shakes out, but also likely won’t want to sign up for the big buyout at the point of acquisition. The Texas front office will not only have to sort out those matters, but will do so against the knowledge that Hamels has significant no-trade rights as well. He can be shipped to the Braves, Mariners, Phillies, Nationals, Rays, Cardinals, Cubs, Royals, and Astros without consent. Otherwise, the lefty will need to be consulted before a deal can be consummated. That may not necessarily prove a major stumbling block, but the presence of the option could come back into play if he’s not particularly interested in a certain locale for future seasons. Certainly, the possibility for a tough-to-navigate situation does exist. While it still feels quite likely that Hamels will be dealt, it’s tough to say at this point exactly how it will come together. As the Marlins offloaded their fleet of talented outfielders over the winter, it began to feel inevitable that catcher J.T. Realmuto would be the next out the door. While there weren’t really any financial pressures at play — he’s earning just $2.9MM in his first year of arbitration eligibility — it stood to reason that the Miami organization might prefer to finish off a painful but necessary offseason and further build out its newly robust store of young talent. Certainly, that seems to have been Realmuto’s hope. He asked for a trade even before Christian Yelich was moved and reiterated that stance thereafter. Given that stance, it seems unlikely that an extension will come together. The Marlins, likewise, are surely aware that the roster is unlikely to be competitive while they control Realmuto, who’s eligible for arbitration for two more seasons in the future. Under the circumstances, it still feels more a question of when than whether the Fish will part with Realmuto. The coming trade deadline surely isn’t a hard stopping point, but it would be foolish for the organization not to market him vigorously. Dealing Yelich proved that the Marlins were ready to embrace a rebuild. Holding Realmuto over the winter does not indicate otherwise; rather, it showed that the club was also willing to exercise patience in achieving value for its best remaining assets. 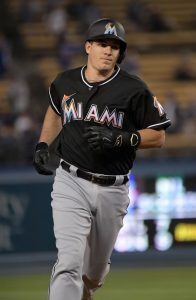 While the decision not to move starter Dan Straily has not looked promising to this point — he’s struggling to keep the ball in the zone after a DL stint to open the year — the Marlins may yet be paid out for waiting on Realmuto, who has looked much better since his own return from the DL. Through 77 plate appearances, the 27-year-old has shown career-best form in walk rate (7.8%), strikeout rate (13.0%), and power (.206 ISO) while producing at an excellent .309/.382/.515 rate with the bat. To be sure, Realmuto has not yet proven he can sustain that kind of productivity over the course of a full season. But it has not been BABIP-driven, as he’s carrying a reasonable .315 mark thus far in 2018. If anything, the Statcast results suggest he has been a bit unlucky, as Realmuto is credited with a lofty .410 xwOBA based upon the quality of his contact, handily outpacing his already-impressive .383 wOBA. Regardless, Realmuto is immensely valuable even if he goes back to being a slightly above-average hitter, as he was over the prior two seasons. He’s youthful. He steals bases. He’s the most athletic catcher in baseball. He has long been lauded for his handling of an ever-changing Miami pitching staff. If there’s a question — beyond whether he’s a useful or a very good hitter — it’s probably in the framing department. StatCorner has rated Realmuto as one of the worst catchers in the game at winning strikes for his pitchers. Baseball Prospectus, meanwhile, has identified significant improvement over the years and graded Realmuto quite well in this area last year. Without a clear consensus in the metrics, it’s tough to say anything conclusively, though perhaps potential acquiring teams would at a minimum expect to be able to draw more out of Realmuto in the framing department given his underlying physical tools. Just how much value Realmuto can return will likely depend upon how he hits over the next two-plus months. Barring a serious injury or total collapse at the plate, though, he has already established himself as one of only a few young, everyday backstops in the game. In this case, then, the Marlins will be marketing Realmuto not only as a mid-season upgrade but also as a solution for clubs that have future needs behind the dish. A high-quality, mid-prime catcher often costs quite a lot more than he’s set to receive. The Pirates seemingly got an appealing price when they promised Francisco Cervelli $31MM over three years in an extension. Russell Martin took down $82MM over a five-year term on the open market. Starting catchers may not necessarily represent a traditional deadline asset class, but they’ve been moved before. Most recently, one-and-a-half affordable seasons of Jonathan Lucroy — then one of the game’s best and most-established backstops — were swapped (along with quality reliever Jeremy Jeffress) for two high-end prospects. Teams interested in immediate catching help may have a few other options. Wilson Ramos has been playing well and could be made available, though he’s more expensive now and will be a free agent after the season. Ditto, Lucroy. Perhaps the White Sox will dangle recent signee Welington Castillo, though he was evidently not strongly pursued by contenders over the offseason. The few poor-performing teams that possess established, controllable young catchers seem less likely to move them for a variety of reasons. With the Pirates and Braves contending to this point, some of the more appealing hypothetical rental targets (Cervelli, Kurt Suzuki, Tyler Flowers) may not be available. In this setting, Realmuto could be in quite some demand. On paper, the Red Sox, Brewers, and Angels have the immediate and long-term need for improvement. The Nationals are getting useful work from behind the dish for the time being, but may well end up needing an upgrade this summer and still lack a long-term solution behind the dish. Though the Astros have been well-served by Brian McCann, they’d be a good fit for the present and future. While the Mets just added Devin Mesoraco, he doesn’t seem particularly likely to be the answer there. A few other teams — the Twins come to mind — could also conceivably emerge as suitors as well. That’s just a preliminary glance, of course. Injuries and other developments can and surely will change the picture over the coming months. Generally, though, it seems reasonable to anticipate that the Marlins will have a good chance to secure a significant return for Realmuto this summer. While clubs that tried to structure a deal for him over the winter proved unwilling to meet the lofty asking price, the pressures of the trade deadline could help enhance the leverage available to the Miami front office.